Rohina Malik is a Chicago-based playwright, actress and solo performance artist. She was born and raised in London, England, of South Asian heritage. Rohina is a resident playwright at Chicago Dramatists, an artistic associate at the 16th Street Theater, and she was one of the four writers in the inaugural group of The Goodman Theater’s Playwrights Unit.Her one woman play UNVEILED had its World Premiere in May 2009 at the 16th Street Theater, directed by Ann Filmer, where it received critical acclaim, and the entire run and extension was sold out. Unveiled received a second production at Victory Gardens Theater, a third production at Next Theater, a fourth production at Brava Theater, San Francisco and a fifth production at Crossroads Theater in New Brunswick, NJ. Her plays Yasmina’s Necklace and The Mecca Tales (a Goodman commission) were both developed and had staged readings at The Goodman Theater. 1. Do you remember your first encounter with stereotypes…if so, what was it? When I first started wearing the Hijab, people had all kinds of stereotypical thoughts about me. 2. What is a common stereotype you have faced throughout your life? That I oppress and that I am oppressed. That I’m anti-American or that I need to be saved. That someone made me wear that veil. That I’m weak, submissive, and pathetic. Growing up in London, as the daughter of South Asian immigrants, racism was intense. When I turned fifteen, I moved to Chicago. The racism of London was difficult, but nothing prepared me for the backlash after 9/11 in the US. Everybody had a story, which ranged from silly to bone chilling. People were murdered because they were Muslim or because they were mistaken for Muslim. As ugly as the backlash was, it inspired me to write Unveiled. The first story was personal; it was based on a painful incident at my friend’s wedding, where I was pushing my double stroller, with my baby and toddler, and a man began to insult me. He had a problem with my veil. The incident almost turned to violence and felt like one of the worst days of my life. It’s interesting how that painful day became the seed that would later become Unveiled. Art can sometimes be inspired by the things that are ugly and scare us. 3. How have you overcome stereotypes/dealt with them? 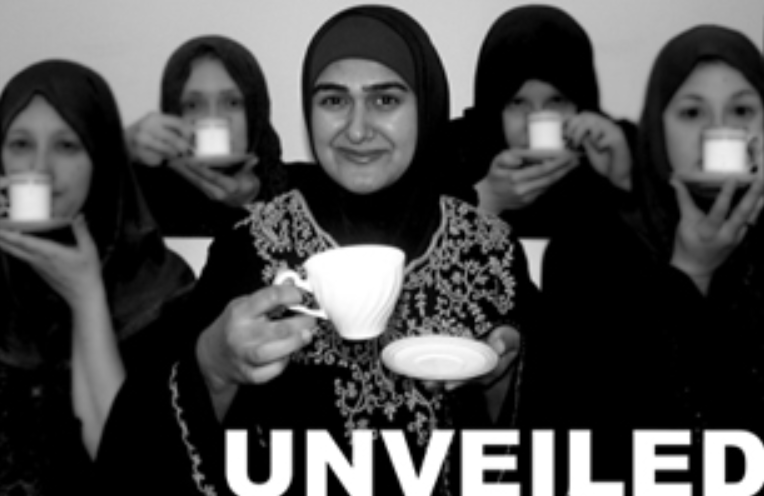 I wrote my one woman play Unveiled to challenge negative attitudes and stereotypes about Muslims. There is something powerful about experiencing live theater with other people at the same time. Theater is powerful because it can create a collective consciousness. I will never forget this young man who cried after seeing Unveiled. He asked to speak to me and told me he was from a small town. It was one of the most powerful moments in my life, and that’s why art is powerful; it can create dialogue, it can create understanding, and most importantly, it can heal. 4. How have stereotypes you have dealt with changed throughout your life, from high school to now? When I was younger, people thought my dad forced me to wear the veil, now they think it was my husband. The truth is, I decided to wear the Hijab. 5. How do you think the stereotypes that you have faced in your life have changed you? It forced me to be a stronger person. Rather than complain and do nothing, I learned that I have to find a way. Theater has been a powerful way for me to engage in a meaningful discussion about stereotypes and why they are so dangerous. 6. In what type of situation do you most commonly see stereotypes present? The airport is always unpleasant. But stereotypes exists anywhere and everywhere. 7. Do you believe we should have absolutely no stereotypes or preconceived notions about a person before we know for sure, or are there any instances in which you think having stereotypes is acceptable? We are all individuals. We need to get to know each other before we make snap judgments about each other. 8. What type of stereotype do you believe is the most harmful? All stereotypes have the potential to be harmful, but negative stereotypes about a group of people really are dangerous. If you study hate crimes, you will find that hate crimes have two things in common. Hate crimes come out of an atmosphere of negative stereotypes about a people and degrading language. If we don’t challenge negative stereotypes and degrading language, the end result could be deadly. 9. What do you believe is the best solution for ridding (reducing) society of the stereotypes that we hold? 10. Do you think that if something is true for 99.99% of a group of people, does that make it less of a stereotype, or are all stereotypes equally wrong? We are all individuals, we may have commonalities, but we are different. We just can’t put all people into one box.